Their points per possession far outstripped any other performance this year whilst their weighting in both games were two of the top three produced since 2012. They were bound to come back to Earth/regress to the mean/ drop off that pace but the fall off was pretty drastic. Their shooting was very poor here. With Dublin taking so many shots at goal sometimes their Conversion Rate can take a hit but not here. They had three shots at goal scoring 2-01. Thus when going for a point, including from deadballs, they converted at a very low 35% (0 – 12 from 35 shots) with a weighting of -4.334. Part of the problem – as can be seen in the shot chart below – was that only 20 % (6 out of 30) of their point attempts from play came from the two central zones. Against Longford this was 60% (21 of 35) and against Kildare it was 55% (17 of 31). So in a few respects job done from Westmeath. They restricted Dublin to 3 goal shots and forced them to shoot from wide where Dublin executed poorly. This came at the expense of their own attacking game plan however. They were only able to move ~50% of their possessions into Dublin’s 45 (Longford 59%, Kildare 83%) and whilst their Shot Rate was about average the very poor Success Rate of 30% (not to mention the weighting of -4.4) tells you that the shots they attempted were poorly executed. We have touched on the main points above so won’t rehash. For the first time this Summer Dublin faced a very defensive team so I was on the lookout for anything that may have changed since the Donegal defeat last year. 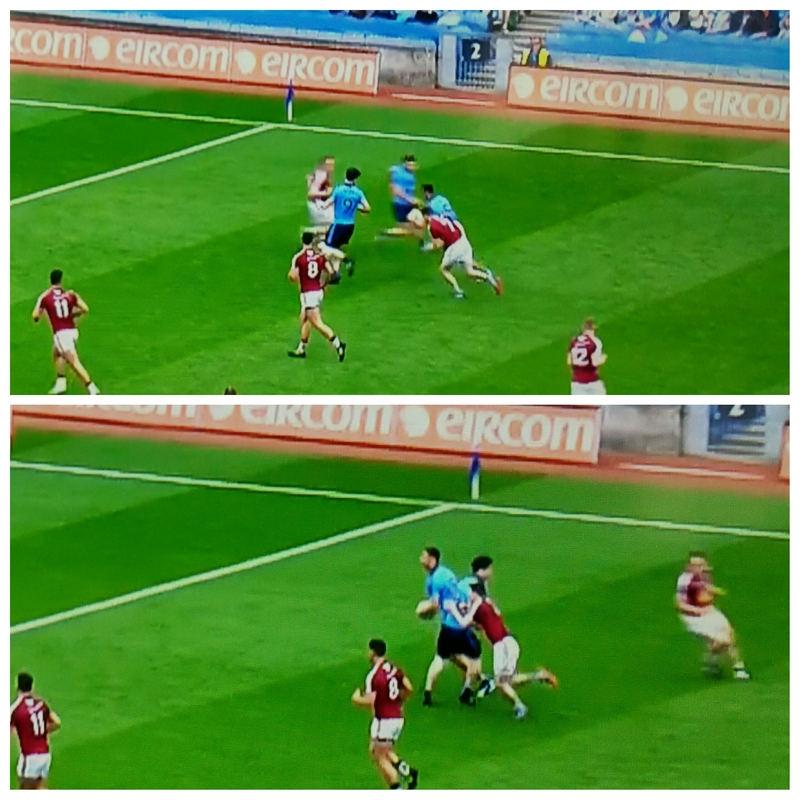 We have heard of Dublin introducing a basketball coach to help them gain an understanding of space and within the first 20 minutes you could see their influence in how Dublin forwards “screened” opposition backs clearing space for the attacker. Three snapshot examples below. 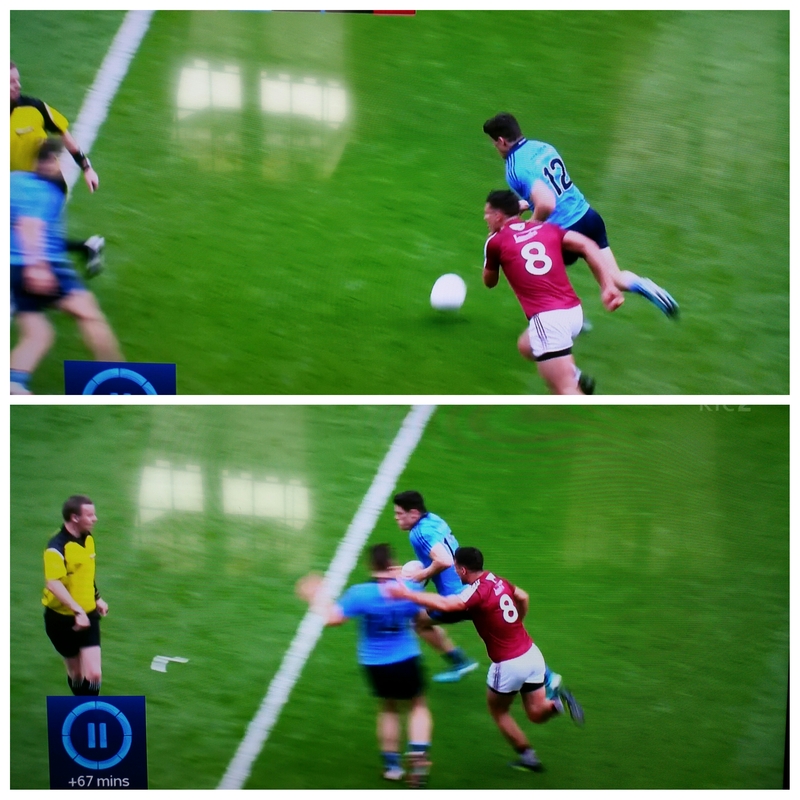 To my mind there is no doubt that the Dublin player without the ball is attempting to block off the opposition defender and the methodology definitely looks coached. If anyone else sets up as defensively as Westmeath it will be interesting to see if this continues. A pretty poor day all round. A prime example of how stats can be misleading. 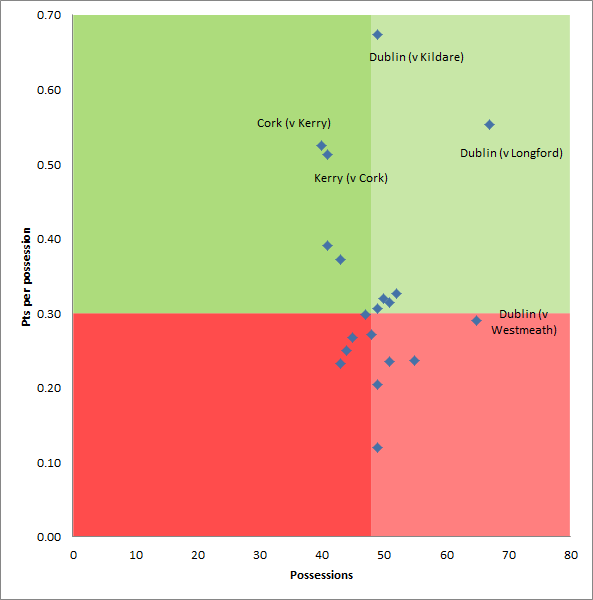 Overall Westmeath basically broke even on kickouts however when we break them down by team we can see that Dublin won all their kickouts (which I’m not sure has happened before). This game also shows the affect that setbacks can have. Westmeath gained control on their first nine short kickouts and whilst they only converted one of those nine possessions to a point they did manage four attacks. Then they had a terrible lapse at the start of the second half when Dublin pushed up and scored two goals off two short kickouts. Westmeath didn’t attempt another short one thereafter. I guess the old Mike Tyson quote of everyone having a plan until they get punched in the mouth still rings through. A very loose game with 68 turnovers in total best demonstrated by the fact that in their last two games combined 6 Dublin hand passes went astray. Here it was 9. No doubt the review session will be uncomfortable for a number of players but especially MD MacAuley. It may be unfair to single out one player but he looks like he’s struggling to get to the pitch of the game following his absence. I have him tagged for 6 turnovers with Connolly the next highest on 4 (all passes). MacAuley has time on his side but from here on in Dublin can’t have two of their main attacking threats coughing up the ball on 10 occasions. •	Both B Brogan (3rd) and D Rock (6th) enter the top 10 individual performances from play and deadballs respectively. Dublin completely overwhelmed Longford. Their opening stat line was 2-14 from 18 shots (82% Success Rate) with the two misses being a B Brogan shot wide right that was touched round the post for a 45 and Kilkenny’s near effort that hit the post – not exactly wild wides! Now the claim will be that there was no resistance – and there is merit to that argument. Of the 16 shots from play attempted in that first half – when the game should have been competitive – I noted only 25% (4 of the 16) of as being attempted when under pressure. If we had opponent adjustments I have no doubt that the weighting would be a lot lower (as an aside there are no opponent adjustments as we don’t see teams often enough. Since ’12 this is only Longford’s 2nd TV game – how would you adjust?) however I’m not sure Donegal in that 2013 QF provided Mayo any sterner a defence than Longford did to Dublin. And Dublin were miles more accurate. Similarly in 2014 when Dublin had way more attacks (57 then versus 48 here) and shots (48 versus 39) against Meath than they did here they couldn’t put up anywhere near as good a performance. It’s a truism but Dublin beat poor opposition – but they produced an unnervingly accurate performance in doing so. B Brogan now has two entries in the top3 performances from play. His 1-06 from nine attempts (+2.806) puts this performance behind only O’Donoghue’s demolition of Cork in 2014 and his own display against Louth in 2012. He played much closer in to goal than has been the norm with seven of his eight point attempts being attempted whilst in or around the 13m line. It happened so often I began to think the line was acting as a trigger for him to shoot. As an aside his only shot from outside the 20m line was a speculative effort from the right that led to a 45. It was also good to see a genuinely two footed player put on a show – 3 with the left and six with the right. Paul Flynn had another super-efficient game scoring 1-03 from his 4 attempts whilst Rock & McManamon combined for 1-04 from their combined 7 attempts. Rock’s four from four included two 45s. With Cluxton in the ranks this is almost a luxury weapon for Dublin. Up until yesterday Cluxton had three of the top six performances from deadballs – if Rock wants to keep the 45s he’ll have to keep producing performances like this. If he does stay in the team, and continues to convert deadballs at this rate, he will soon challenge the very top performances. As it is this game sees him slot in 6th on the overall deadball top10. Nothing much on the Dublin side as they only had 13 kickouts throughout the whole game – though it was strange to see Cluxton fluff a short one and present the ball on a plate to Kavanagh. Still better it happen now than in a more meaningful game. Longford almost refused to go short. They did quite well on kickouts that dropped short of the 65 but once they went long they were absolutely wiped out losing the possession battle 16 – 3. Dublin launched attack after attack from Longford’s long kickouts scoring 3-04 from those 16 possessions. If there is one area that Jim Gavin may wish to emphasise in the post-match briefing it will be ball retention and Dublin’s relatively high turnover rate. In a match that they completely dominated they gave the ball away as frequently as Longford did. Although 16 passes going astray is quite high 12 different players contributed to that 16. It would appear to have been a team trait, or malaise, rather than any one player. Maybe it can be written off as “one of those things” as players tried to force the ball in quickly against inferior opponents. The Dublin machine rolls on. Their consistent brilliance this year can mask just how phenomenal the numbers are. In near on 100 games no team had breached 50 attacking possessions – Dublin’s last four games this year (Cork & Derry in the league SF & final, Laois and Wexford) have produced 54, 57, 51 & 56. In four games they have averaged 54.5 attacking possessions – that is a full 52% more than the 2013 Championship average. Simply breath taking. Allied to the volume of possessions their Shot Rate has been above average for those four games – 83%, 82%, 82% and 80% here – which means that they have had 62% more shots over that 4 game span than the 2013 average. 62%! Their defence has fluctuated more than the offence; in the aforementioned games Dublin have allowed a shot rate of 80%, 69%, 75% & 82%. Against Kildare Meath’s shot rate was running at 90% 5 minutes into the second half – they may well have to produce something similar for longer if Dublin maintain their attacking output. Three of Dublin’s first six shots from play were attempts at goal (all Mannion). This is par for the course with Dublin however their ardour cooled thereafter with only two more attempts at goal (both converted). This left a goal to point attempt ratio of 1:6 – which is much lower than their usual 1:3. An arbitrary point granted but until Costello was introduced all was not rosey in Dublin’s attacking garden. They had a Success Rate of 32% (6 from 19) with a weighting of -2.903. Thereafter Dublin maintained a Success Rate of 72% (13 from 18) with a weighting of +4.236 including a closing sequence of 1-08 from their last ten chances. Now this is not all as a result of the introduction of Costello but indicative of how their substitutes bench has helped them close out the last two games. In those games the subs are a combined 19 from 24 shots (Success Rate of 79%) with a weighting of +6.693. Ridiculous output – even against tiring teams. Whilst the deadball striking may not have been as spectacular as some of the attempts we have seen this year (Morgan, Beggan et al) it was deadly effective. Six different players combined for 100% accuracy (12 from 12) with a weighting of +3.269. You cannot ask for more. From their two games in the Championship to date Dublin are a combined 88% (14 from 16 – the only two misses were two Cluxton 45s) with a weighting of +2.434. What might be more impressive is the ease with which they appear to be able to change free takers. Rock came on for a cameo against Laois and hit 3 from 3. He was faultless here but Costello then came off the bench and slotted his two frees very easily. A tale of two kickouts strategies – Dublin absolutely dominated their own. Truly dominated. Wexford on the other hand broke even on theirs but the manner of the kickout meant that whatever ones they lost were effectively turned into attacking possessions by Dublin. What is perhaps surprising is that Wexford continued to kick contestable balls – only four of their 38 kickouts went short. Surprising that the turnovers were much the same but again we see that Dublin are very good at converting those turnovers to shots. Wexford were ok in this regard and the fact that Dublin coughed up 9 turnovers in the tackle – and “allowed” Wexford get a shot rate of 53% – will give Meath (and Galvin !) something to work on. Stats eh. From the below we will see that Kildare “won” the kickout battle, were much better than Meath at converting the turnover ball they won into shots and basically had the same shooting performance from play as Meath. But this game was effectively over from the 40th minute when Meath went 12 points up. You can see from the above that up until that 40th minute interval Meath were phenomenal converting 90% (!!) of their attacks into shots and converting those shots at a well above average 56% of the time. Considering that 7 of those 27 shots were for goals their statline when attempting points was a phenomenal 13 from 20 (65% Success Rate) with a weighting of +3.2286. Kildare on the other hand only converted 68% of their attacking possessions to shots. So whilst there has been considerable focus on Kildare’s defensive set up they were having difficulties getting shots off up the other end as well. Of the 7 attempts at goal Meath scored 2-00; Kildare had 4 and scored 0-03. Meath had their 7 before Kildare attempted one however – indeed they had 6 in the first half. Outside of their 6 shots at goal (the 7th was the penalty) Meath had a statline of 12 from 22 (55% Success Rate) with a weighting of +1.712 when shooting for a point. Considering that their main shooter from last year, Graham Reilly, only had three shots that’s an excellent return. Excellent deadball accuracy from Meath considering that their main protagonist last year, Newman, was not on the field. The only miss was from a free outside the 45 at a tight angle from the right hand side. Indeed Kildare’s defensive discipline in this aspect was very good – only conceding four frees within shooting range and none of them in prime position – it was just that Meath’s ball striking was excellent. Kevin Reilly was excellent however he gave away the free for four of Kildare’s six shots from deadballs. Obviously you don’t want to take the physicality of his game away however in a tighter game such frees may all too easily relieve pressure building up on the opposition. Ostensibly Kildare won the kickout battle. They won 72% of their own kickouts and gained 5 extra shots. Meath went short on four occasions so when their kickout was contestable (beyond the 45) the split was 50:50. Given the power, height and sheer physicality of Meath in that sector Kildare will have been happy with that outcome. Two things here from a Meath perspective. Firstly they “only” converted 46% of their turnovers to shots. We have seen that Dublin are in the mid 70% range for this so to stay with Dublin in the final they will have to take every chance that comes their way. The second is just how many times they lost the ball in the tackle – seven different players lost the ball on eight separate occasions. The majority of these turnovers were from one tackler as well. Although none of these occurred in their defensive third of the pitch it may not matter against Dublin given their high shot rate from turnovers – Meath will need to mind the ball better. Kildare “gave” the ball away on 15 occasions in the first half but at least 8 could be considered on the very poor side with five (!!) hand passes going astray as well as a sideline ball and two close in shots that were blocked. 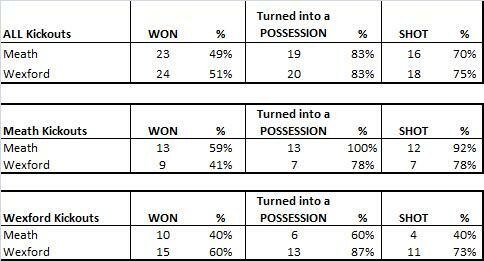 Only two of these specific eight turnovers resulted in a Meath shot but the fact that they occurred at all showed up the entire poor first half display. Again we see the “left hand side syndrome” rearing its head. Of their 28 shots from play Meath only attempted one from sector6 (left between the 20m & 45m). Kildare attempted three – less than 9% of all shots came from “wide left”. By comparison 13 (28% of all shots) shots came from Sector4 “wide right”. I would guess that McDonagh’s weighting is quite out of line with what most people would expect. He had four attempts at goal and converted one – twice he was denied in the one move by a very good double save from Donnellan whilst the Kildare keeper also denied him in the opening minutes. On top of the fact that he missed his two attempts at a point (one from Sector8 in front of goal) he does not get any benefit for winning the penalty – the weighting measures shots only. Stephen Bray hit 4 from 4 when going for points – his only miss being the attempt at goal he dragged wide on the near post in the first half. Dublin may have had 57 & 54 possessions against Cork & Derry in the league but this performance is the only time that any team has breached 50 possessions in a Championship game. Whilst that sequence of numbers are scary in themselves what may be more troubling for pretenders to their All Ireland crown is the fact that whilst they have maintained a very high Shot Rate (82% here; 82% & 83% against Cork & Derry) they improved their Success Rate – it was 49% in their two aforementioned league games. Maintaining 55% accuracy from that volume of shots is excellent. Part of that second half prowess comes from some fabulous shooting from Dublin’s substitutes. The combined stat line for those sprung from the bench was 12 shots with a 75% Success Rate and a weighting of +2.919. Rock & Costello scored the last 6 points from 6 shots when it could be argued that Laois were “gone” but you still have to have the ability to put players in those positions and have the squad that can finish the moves off. Dublin quite obviously have both. So what of Laois? They came out of the traps on fire. By the time they committed their first turnover they had taken 8 shots from 8 possessions. It was the 12th minute, when O’Loughlin tried to pass the ball across the square to an outstretched Munnelly before they had an attack that did not result in a shot. Of course what really helps against Dublin, alongside a very high Success Rate, are goals. Laois didn’t manage one shot at goal. In a previous post it has been shown that Dublin go for goal more than any other team – they were at it again in this game. Dublin had 9 shots at goal which equates to one shot at goal for every 2.8 point attempts – the average in last year’s Championship was 1 shot at goal for every 6.7 attempts at a point. With such a poor Success Rate on goal attempts (22%; 2 from 9) then Dublin’s attempts at points must have been stellar to maintain such a high overall weighting – and they were. They converted 60% of their point attempts (15 from 25) with a weighting of +3.370. As stated earlier those numbers are somewhat padded by how the game ended but even removing Costello’s three late points Dublin converted 55% – still well above the average. A special note for Munnelly. Watching his performance live you knew you were watching something noteworthy. Not only did he convert five shots from six attempts but they were from quite varied positions on the pitch – two from Sector 4 on the right, one from the centre and two from inside the 20m line on the left. Oh and one of his frees was from outside the 45. His weighting for his shooting from play is better than anything recorded in last year’s Championship. Better than Dunne’s performance for Cavan against Armagh, Kielt’s against Down or the Gooch’s against Tipperary. It will be an exceptional shooting performance that tops what we witnessed on Sunday. Nothing overly spectacular in those numbers. Kingston gets penalized heavily for missing the free from Sector 9 (it is the weakness of the sector approach – shots from wider out are treated the same as those nearer in. Overall the swings and roundabouts will even themselves out but in specific games it can look harsh) whilst the two he converted were relativity simple. Cluxton converted 2 of his 4 45s which is bang on average. There was no pressure on Rock’s three frees towards the end of the game however he was still very effective considering how little time he had to get up to game speed. Having a deadball striker of the caliber to call on could be hugely vital in closer games should Brogan be injured or his radar not function. Ostensibly Laois won the kickout battle. They won 5 more kickouts than Dublin (gaining possession on 35 kickouts to Dublin’s 30) and also harvested 6 more shots than Dublin did from possessions directly attributable to kickouts. They performed as well on Dublin’s kickouts as Dublin did on theirs whilst performing better than Dublin did on their own kickouts. It is not often we have seen that. This is all the more commendable when you consider that Laois only went short on 9 of their own kickouts whilst Dublin went short on 16. Stripping these out Laois won 61% (22 out of 36) of what may be deemed contestable kickouts – 17 out of 24 on their own kickouts and 5 out of 12 on Dublin’s (unfortunately the cameras missed where 4 of the kickouts landed). Of the 16 that Dublin went short on they won 15 and got a shot from 8 of them (53% of the time) – which is on a par with the returns observed in last year’s Championship. Again we see Dublin’s fantastic ability to convert turnover ball to shots. In the league final against Derry they converted 24 of 33 (73%) turnovers into a shot. Again against Laois they converted 71% (22 from 31) of turnovers into shots. No other team has breached 50%. Of the 31 turnovers Dublin received the ball in their own third of the pitch 22 times turning 13 of these into a shot. Of course that means that when Laois gave away the ball outside Dublin’s 45 every one of them was turned into a shot. I’m not sure if the top teams held a conference after last year’s Championship but following Mayo’s unbalanced shooting chart against Roscommon Dublin have followed suit. They only produced one shot for a point from the left hand side – in 2Again there is no evidence of this being a “thing” for Dublin so we will chalk it down as a one off – but still that is two performances back to back from big guns with a combined total of 1 shot from play from the left hand side. A mixed bag from Dublin with very high levels of Possessions & Shots – second in both categories just behind their own performance against Westmeath – but poor shooting as evidenced by a Success Rate of 44%. The poor Dublin shooting cannot be attributed to excellent Meath defending (though one sector did prove resilient – more of that anon) as there was pressure on only 55% (15 /27) of Dublin’s shots which is below what the top teams would produce. Dublin’s radar just happened to be off centre. Meath’s returns are in line with the average but this is skewed somewhat by the final 10 minutes when they were chasing the game. After the second goal Meath had eight possessions but only got a shot off with four of them and only scored on one. Prior to that period Meath had a Shot Rate of 89% and a Success Rate of 54% – their shooting was excellent and it was this, combined with Dublin’s profligacy, that allowed them to stay as close as they did, for as long as they did, whilst Dublin enjoyed such numerical advantage in terms of possessions & shots. After the opening salvo of 1-01 Dublin went approx. 30 minutes in the first half taking nine shots from play and scoring once. Yes they did come out in the second half and improve – Conversion Rate of 45% from 15 shots – but as the competition hots up you will not be able to get away with such long periods of profligacy. There were quite a number of shots at goal from deadballs. This is probably more an indicator of both team’s confidence in their long-range strikers than a side effect on the game itself. Remove 45s and shots from 40m or greater and the total volume drops to twelve. Newman recovered well after missing the first two frees to convert five from five – the final miss was a shot at goal from the 21m line when Meath were chasing goals. The fact that the last free was so close to goal means that his weighting was severely affected – we cannot yet give a weighting to shots for goal from a free as I would say I have recorded less than 5 in total; instead it is treated as any normal free – remove this and he had an above average day. Cluxton’s returns were below average. Yes he hit three nice scores from the 45m line but he also missed another 3 from the same range. Those 6 more or less even themselves out leaving the missed free out on the right hand side. Not a bad day – not a good day either. It is quite noticeable how much Dublin favoured the right hand side when shooting. Drawing an imaginary line up from the left parallelogram Dublin only took six shots from play from outside this line – and missed all six. It wasn’t just one player either – McManamon, Kilkenny, Brogan and Flynn all missed. There was no evidence of this bias in the Westmeath game so whilst accepting it could just be random chance I would be inclined to attribute this lack of shooting to Meath’s right hand side defence. A very even battle overall but perhaps slightly surprising splits given the nature of the commentary after the game. Meath were praised for how they managed the Dublin kickouts but this may be a case of first impressions lasting. 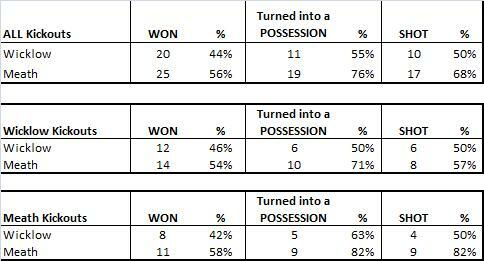 Meath won possession on the first four of Dublin’s kickouts however only won possession on 19% (3/16) of the remainder. In their previous game against Wexford (see here) we noted how the Meath kickout was fairly predictable but that this fact alone did not necessarily make it easy to defend. So it was in this game. 89% (24/27) of O’Rourke’s kickouts went long – passed the 65m line – whilst 67% (18/27) went down the middle … yet Meath won possession on a healthy 59% of their own kickouts. Much praise was, rightly, heaped on Kilkenny for his performance but Mannion was excellent as well. Reilly & Byrne had a combined Success Rate of 69% (11 from 16) against Wicklow & Wexford but only managed 2 shots against Dublin. It was there for Wexford but this game was won by Meath’s superior Success Rather than lost by anything Wexford did/didn’t do. Having said that Meath’s high Success Rate is in no small way helped by Wexford continually fouling Meath forwards within Newman’s range. Wexford’s shooting was poor. Lyng, Brosnan & Barry produced basically average returns which meant that none were able to cover for Banville’s very poor day (converted 1 of 6 chances). Not only will Meath be concerned with the volume of shots that they conceded but when Wexford were dominant in the first half Meath only got pressure on one of their opening eight shots. This did improve from midway through the first half where Meath managed to pressure 80% of the remaining shots but with Dublin on the horizon they will need to ensure this pressure is present from throw in. Brosnan had a poor day as he missed a relatively simple free from in front of goal just before half time whilst Lyng was basically average as he also missed a simple enough free from the right on the 21m line. Newman was excellent. A lot of frees were of the type that a good free taker would be expected to convert – the main point is that he did convert them. As a result his weighting makes this the 3rd best deadball performance in 2013 behind Murphy’s performance against Down & Goulding’s against Kerry. Wexford’s discipline deserted them in the second half. Giving a team, that has as deadly a marksman as Newman in its ranks, 9 frees in a half is very poor. The argument is made that they were run ragged and chasing the game *but* seven of those frees came before the 60th minute and they were never more than three points behind during that period. They were equally adept on Wexford’s long kick outs as they won possession on 62% of those (8 out of 13). The problem in the Leinster final is that Dublin’s kickouts are a lot more sophisticated than hitting them long. On any Wexford kickout that did not go past the 65m line Meath only won possession on 17% (2 out of 12). If Meath replicate this against Dublin then their own kickouts will be very predictable (though that does not necessarily mean Dublin can gain parity) whilst Dublin will have control over their own kickouts. With ten minutes to go Kildare were cruising, eight points clear and their focus switched to a Leinster semi-final. Then they gifted Offaly 1-2 – the goal from a penalty as well as a point from a free – and suddenly Offaly were within striking distance. It was a worrying slip for Kildare. They allowed Offaly to get a shot away on each of their last five attacks. That took Offaly’s shot rate up from 68% to 74% while their success rate improved slightly from 50% to 52%. Kildare’s dominance is evident by the 41 attacks they mounted during the game while their strength at midfield gave them a stranglehold on the game from the very beginning. Although both sides were above average from play, Kildare will be unhappy with their return. Seanie Johnston’s second half cameo didn’t do much to help them as he kicked three wides from play – all of them from very close range. Kildare struggled when Offaly isolated Niall McNamee up front – who scored some sublime points from play – but when Offaly were slow in their build-up play, it allowed Kildare time to get numbers back and make it difficult for them to even create a shooting chance. On the plus side for Kildare, they had a good spread of scorers and the three half-forwards contributed 0-12 from play. Eoghan O’Flaherty and Paul Cribbin were both four from five while Niall Kelly hit four from six. Combined their return from play was 75% – the kind of return we’re not used to seeing from Kildare. Although Offaly scored the only goal of the game, Kildare created the best goal chances. Alan Mulhall made an excellent stop from Eoghan O’Flaherty in the first half and he spread himself well to deny Tomas O’Connor in the second. O’Connor’s display will be a big worry for Kildare though. His handling was poor and as well as missing the two shots on goal that he had, he looked uncomfortable taking them. O’Connor needs a support player off his shoulder and as the game wore on he the confidence just seemed to seep out of him. 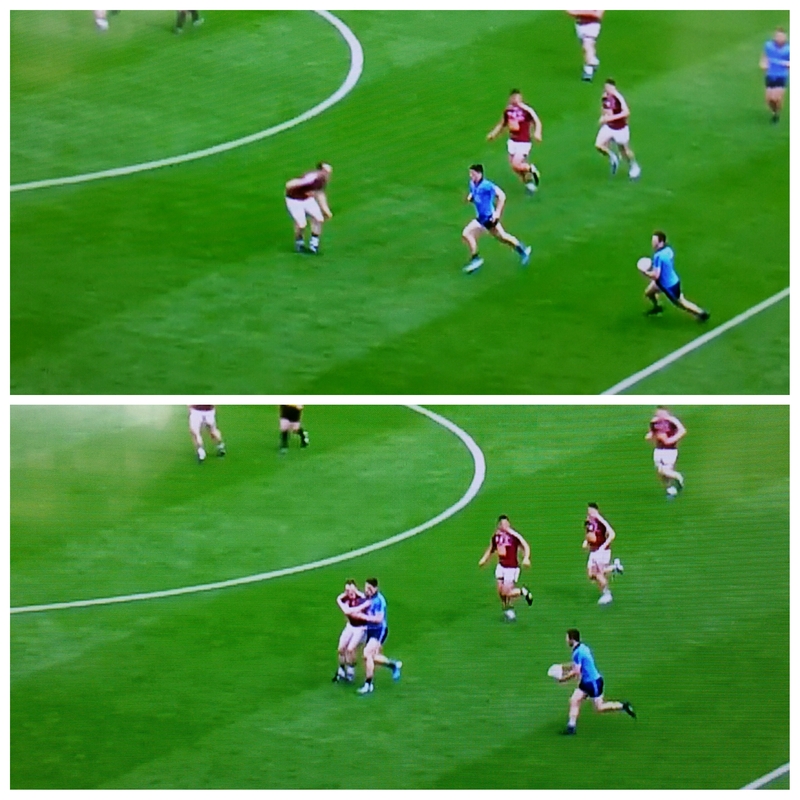 At one stage he gave a hand-pass to the in-rushing Fionn Dowling which almost clocked Dowling in the face. As they prepare for Dublin – and the attacking onslaught they’ll face – Kildare will need better concentration at the back and more penetration up front. Against the in-form team of 2013, they’ll have their work cut out. Offaly were content to kick the ball long on all but four occasions in the game but they probably accepted beforehand that it was better to lose possession there than risk anything closer to goal. Kildare’s midfield pairing of Daniel and Daryl Flynn really went to town on the Offaly kickout, winning more than half (13 of 24) of the ball Alan Mulhall kicked there. Kildare had a much more varied approach on their own kickout as Mark Donnellan went short eight times while Kildare won the vast majority (74%) of their own ball (14 of 19). However the Lilies struggled to convert all that possession into scores. While they were adept at creating chances going forward from midfield – of the 14 kickouts they won from Donnellan, 9 led to shots on goal – they managed just four points from all that primary possession. Overall Wicklow did quite well, considering the conditions, however they were just out performed by a Meath team that had their shooting boots on. Possession numbers were lower than what we have seen in the Championship to date however this is attributable to the gameplans implemented due to the very strong wind. The total number of possessions in the first half was just 27 – Meath used the wind to hit in long balls that did not always favour the forward whilst Wicklow played a slow, deliberate, possession game that reduced the frequency with which they crossed the 45m. The table below shows a straight comparison of how teams shot in the conditions. Both were quite similar with the wind however it was against the wind that Meath really prevailed. Joe Sheridan’s point from out on the right wing was a thing of beauty. Please note that Kevin Reilly’s goal is not included in any of the numbers. It had a huge bearing on the game but was a complete fluke and as such doesn’t really fit with any of the definitions currently in use. Newman had a very good day from deadballs capped by an excellent 45 against the wind. His day would have been stellar had he not missed an easy enough free, even given the conditions, from the 21m line. The Wicklow numbers are affected by the particular type of deadball missed. McGrath is somewhat harshly judged as one of his misses was a sideline attempt. We don’t have enough sideline attempts charted so they are treated as frees – and thus probably overly penalized. Having missed a penalty Stafford should probably not have as positive a return as he does but again we do not have enough data on penalties and thus he is treated as having missed a regulation free. We have already mentioned Newman’s 45 against the wind but Meath’s shooting, and shot selection, from long range was excellent. When they used the wind from out the field it proved very effective. A huge bomb from c50m from Brian Meade comes to mind. The same cannot be said of Wicklow; they only scored once from outside c25m and there were too many shots taken from bad angles out wide. 60% of their kickouts against the wind so may have felt they were justified kicking long however Meath got three shots from the six Wicklow kickouts that they won in the 1st half. Throwing a few short ones in may have reduced this. There were a number of fine performances with Graham Reilly’s returns being the pick. He ended up with 4 points from 6 shots however started on fire getting three from three in the first 15 minutes. Half way through the 2nd half he was four from four and on his way to one of the performances of the season. For all the commentary about how fast Wallace is it was somewhat overlooked that there was an end product to go with the speed. Three points from four attempts is an excellent Championship debut.